Every month I curate a playlist for The Birthday Party Project. April’s upcoming theme: Superheroes. Without further ado, here’s my Superheroes Kids Birthday Playlist Theme. Believe it or not this turned out to be much harder than I thought it would be. A lot of theme songs are “scores” and not exactly party-esque when we’re doing an upbeat 1 hour party. There were a few I was able to find that worked (Battle Without Honor or Humility, Theme From Superman, Justice League Main Title, Guardians Of The Galaxy, Pray For Me from Black Panther) but I started playing off the word “heroes” to fill in the rest. Unfortunately, not a ton of current tracks with that type of theme. I went with “Heroes” by Alesso and Tove Lo and “Save The World” by Swedish House Mafia for some current selections. Even “The Man” lyrically seems to fit. That sprinkling of tracks gave the playlist enough of a superheroes bent. To fill in the rest, I added some current hits Like “God’s Plan”, “Thunder”, “Havana”, “Magenta Riddim” as well as some line dance material with “Watch Me Whip” and “Rolex”. Let me know what you think. It was August of 2017 when I met the founder of Vibo, Michael, who had come to the US from Israel with a plan to launch the newest innovation in the DJ industry. When he gave me a demo of this product, I instantly knew it had potential. Over the last few months, I’ve been working with him and his team in developing it and the product is launching OFFICIALLY at the Mobile Beat Show next week in Las Vegas, NV. I’ve officially put my name behind the product because I know it will not only help Djs but clients as well. Check out the teaser video here. Want to see this in depth? I’ll be giving a 45 minute live demonstration at Mobile Beat on Monday, March 12th at 12:45PM in one of the demo rooms. Vibo will also be on the tradeshow floor all week. Trust me, get this product NOW and not only be ahead of the rest of your competition but take your client care to another level. Your brides and grooms will love you for it. I’m hoping Spring is around the corner because these cold temperatures are getting ridiculous out here in NYC. Good news, I’ve got a Turks & Caicos trip on the March 2018 Brian B Event Schedule. This month is chalk full of events. I’ll be working with John Gandy Events for the first time in 2018. 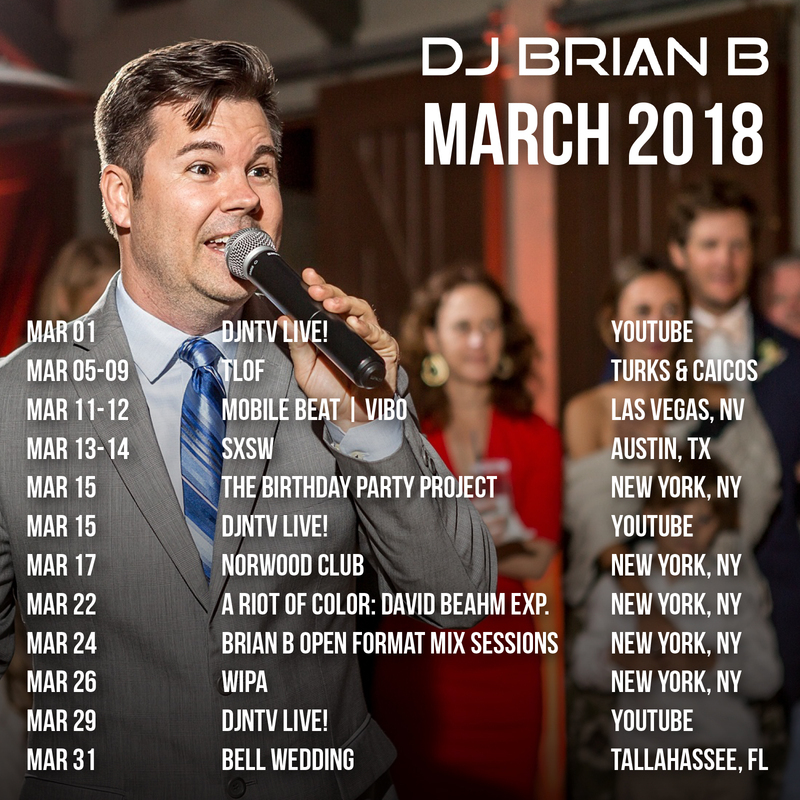 Other events include a return to the Norwood Club, Mobile Beat with VIBO, SXSW in Austin, Texas, The Birthday Party Project, a David Beahm Experiences event, WIPA, and of course Disc Jockey News TV (every Thursday at 9PM EST).